CMON Limited, Mandoo Games, and Capstone HK Ltd are pleased to announce they have entered into a licensing agreement for the exclusive, worldwide, English language rights to the upcoming game Banana Bandits. This fun, tactile, fast-paced game of ape action is sure to be a great addition to everyone’s collection and draw an eye or two thanks to its unique, 3D tower. 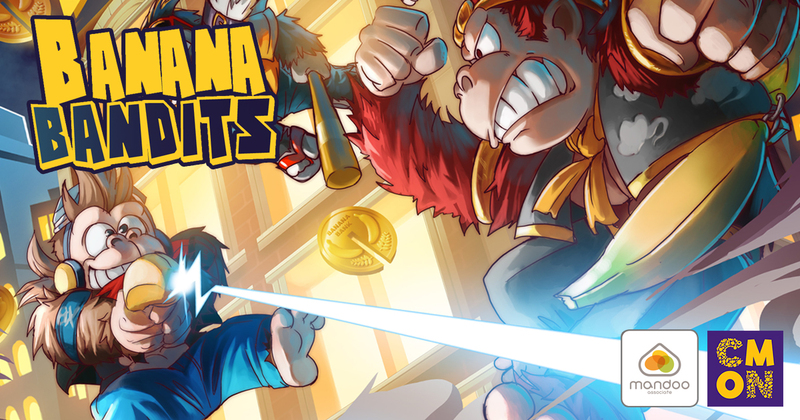 In Banana Bandits, players are vying to become the new leader of the Banana Bandits gang, a group of highly-trained, banana-loving, Gorilla Bandits. To do so, players will literally climb their way to the top of a unique, 3D cardboard tower, fighting with and stealing from other hopeful Bandits. Once a player has stolen enough Gorilla Coins and converted them into 3 Golden Banana Coins, they instantly become the new gang leader and win the game. To steal those coveted Gorilla Coins, the Bandits must attack each other using an intuitive dice system and various cards that will add bonuses during the fight. Each game is fast-paced, lasting around 30 minutes. Banana Bandits will include a 3D Banana Bank Tower, 4 sets of Gorilla cardboard figures and tokens, 44 Gorilla Coins, 10 Golden Banana Coins, 8 dice, 40 cards, and 1 rulebook. It supports 2 to 4 players, ages 14 and up, and is due to release in Q2 of 2017. CMON Limited is an international publisher of board games, tabletop games and apps. Beginning from small hobbyist roots, CMON has grown into a multinational group that publishes several award winning games, including Zombicide, Arcadia Quest, Blood Rage and more. Follow CMON on Twitter, Instagram and Facebook. Mandoo games is a Korean board games publisher and consulting company working with several game studios. Mandoo Games presented Rising 5, Slide Blast, Lucien & Edgar, Sherlock 13 and several other titles at Essen Spiel 2016. Capstone HK Ltd is a game publisher located in Hong Kong. Capstone has developed several nice HK style games, such as Internal Affairs, Pinocchio and Wooolf!.